Happy Pi(e) Day, friends! And since it’s 3/14/15, it’s a particularly special one this year. Or, at least, for this century, it’s a particularly special one. And, I know Vi Hart might not be pi’s biggest fan, but this year, I’m feeling festive. When I was at my parents’ house last month, I found my old Academic Decathlon shirt, where my “number” was pi. Yep. I was that nerd. So, it’s probably not that much of a surprise that I actually kind of like math. Even though I literally fell asleep in every math class that I took starting in 9th grade, I found at least some small enjoyment in puzzling through problems throughout my schooling. The sleeping thing may have been because I found math oddly comforting. Both of my parents are actuaries, so in our family, we say that it’s just in our blood. My affinity for mathematics and affection for pie combined had me dreaming up Pi Day festivity permutations all week. 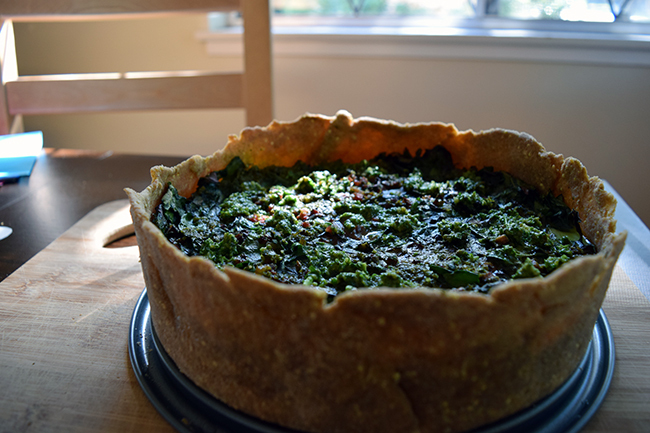 I decided on a reasonably virtuous chard tart, with a multitude of leaves just barely bound with eggs. They’re surrounded by a sturdy whole wheat circumference with millet for crunch. 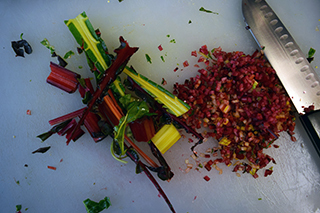 I didn’t want to lose the pretty color on the rainbow chard stems, so I mixed them in, minced. 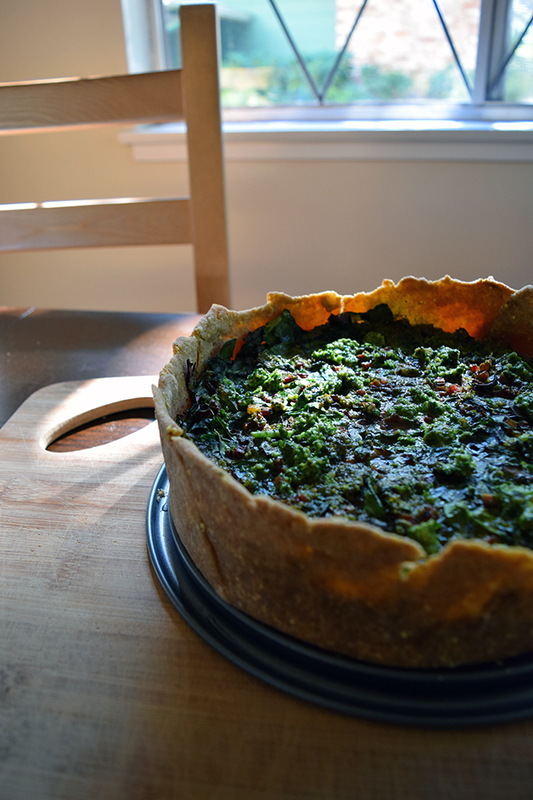 Topped with bright green parsley pesto, I think this tart looks like confetti for the best kind of party, and that is, of course, the kind where you get to eat a slice of pie. It’s also very green, both in color, and in taste. We’ll pretend that I had the foresight to plan that for St. Patrick’s Day, also coming up. 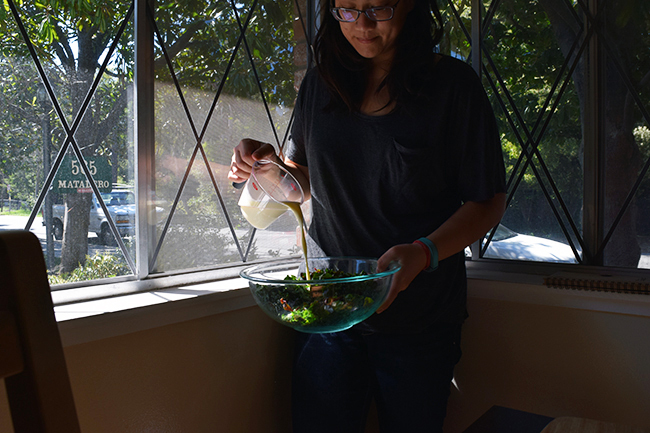 Speaking of deluding ourselves, we can also just make believe that I usually pour milk into mixing bowls standing by the windows, right? I’m totally owning rolling out pie dough with a bottle of Campari, though. 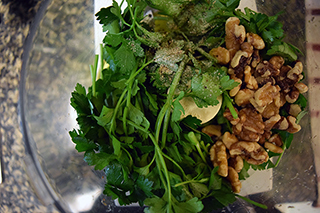 Make the pesto by pulsing parsley, walnuts, lemon, and half the olive oil until it forms a paste. Add more olive oil until it reaches the consistency you like. I went pretty thick with this one so it could cover the tart in dollops rather than a drizzle. Season with salt and pepper to taste. 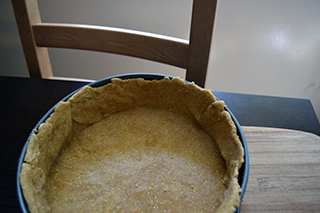 Make the crust by adding the flour, cornmeal, half the millet, salt, and oil in a bowl. Add the water, bit by bit, until a dough forms. Knead it once or twice, just enough to bring it together. Lightly flour a flat surface, and turn the dough out. Roll the dough into a large circle. The millet sort of acts as a handy indicator for when the dough is the right thickness. Drape the dough over the pan and carefully press and shape until the pan is lined. 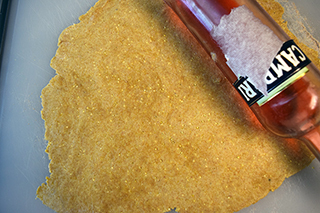 Trim the excess, if necessary — it bakes into nice little crackers if you want. Place the dough and pan in the refrigerator to rest for 30 minutes. While the dough rests, prepare the filling. Strip the chard leaves from the stems and chop into pieces about an inch wide, placing into a large bowl. Using your hands, squeeze/massage the chard to bruise it. Remove as much moisture as possible by squeezing with a paper towel. Mince half of the stems into very small pieces (optional, mostly for aesthetics), and set aside. 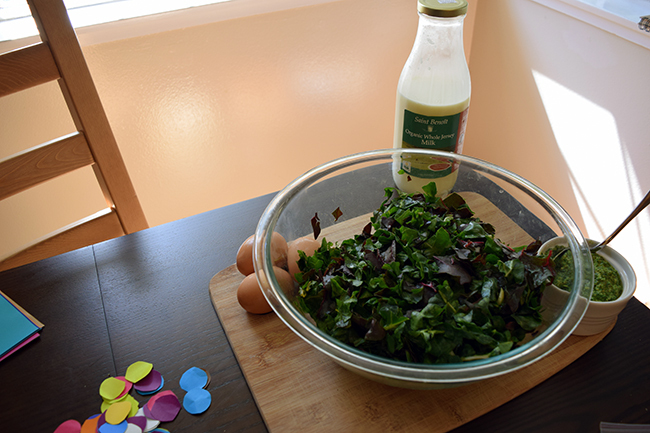 Add eggs, milk, and minced stems to the leaves, and beat with force to further bruise the leaves. When dough has rested for 30 minutes, prick it with a fork all over the bottom and sides, and bake for 10 minutes. Reduce the oven temperature to 325˚F. Pour the filling into the crust and bake until the filling is set, 40 minutes to an hour. You may want to cover the edges of the crust with foil midway through if they are browning too much. Scatter flecks of parsley pesto over the top, and slice and serve immediately.